If I asked you for a list of pantry essentials, it would likely include items like canned tomatoes, pasta and/or rice, chicken broth, maybe a can or two of tuna, and peanut butter. And beans. Doesn’t every well-stocked pantry have at least one–and likely more–can of beans? The convenience of canned beans is so undeniable that it’s easy to forget about bags of beans. Dried beans require a modest effort, but it’s mostly hands-off and really easy. And when you consider the cost savings along with the fact that the cooked beans can be frozen in recipe-ready packages, the tiny effort is well worth it. Sort through and rinse the beans: Place them in a large colander and look for any loose skins, shriveled beans or anything that looks like a small stone. Then rinse the beans, swish around a bit, drain, and transfer to the soaking/cooking pot. Soak the beans (there are two good options): First, add water to cover the beans by at least two inches. Cover and let stand overnight or up to 24 hours, refrigerating if the kitchen is very warm. Drain well and discard the soaking liquid and give the beans another quick rinse. Alternatively, for a quick soak, bring the pot of water-covered beans to a boil over high heat. Boil for 2 minutes, remove from the heat, and let stand for 1 hour (it’s ok to let the beans sit for an extra hour or two). Drain as with the first method. Cook the beans: Add fresh water to cover the beans by two or three inches, and bring to a boil over high heat. Do not add salt or oil. This can lead to either tough or mushy beans. Reduce the heat to a simmer, cover the pot with the lid, and simmer according to the cooking time specified for the bean you are using. This could take 30 to 60 minutes or more. (The orca beans in the picture took exactly 60 minutes for me.) Older beans sometimes require longer cooking time. To be safe, occasionally taste a bean as you near the end of the cooking time. You want the beans to be tender but not mushy. Cool the beans: When the beans are cooked to your liking, drain them and rinse a few times with cool water to stop the cooking process. Drain well and cool throughly. I think food freezes better when thoroughly cooled first–no steam that will create ice crystals. It’s fine to cover and refrigerate the beans for several hours or overnight and package later. 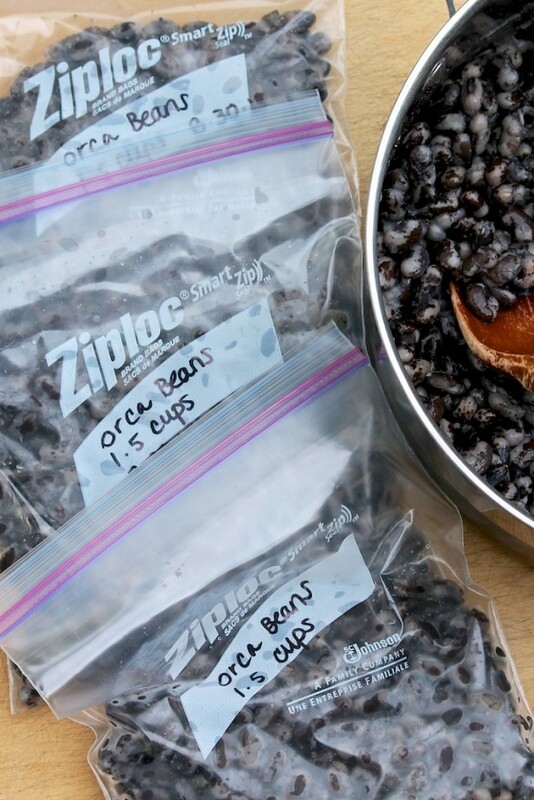 Storing the beans: For the equivalent of a 15.5-ounce can, measure 1 ½ cups of the cooked and cooled beans into a freezer-safe container or bag. Label with the date, type of bean, and amount. Frozen beans may be added directly to soups and stews; the hot liquid will thaw them quickly. When it’s necessary to start with thawed beans, allow the frozen beans to thaw overnight or place a sealed bag of beans in warm water to thaw more quickly. Cooked beans may be stored in the freezer for approximately 6 months. One (15.5-ounce) can of drained beans is the equivalent of 1 ½ cups of cooked beans. One pound of dry beans equals two cups, and each cup of dry beans will yield three cups of cooked beans. So, a typical one-pound bag will yield roughly six cups of cooked beans. A standard bag of dried beans contains one pound of beans, some contain more. (The bag of Bob’s Red Mill orca beans I used here contained 22 ounces of dried beans. 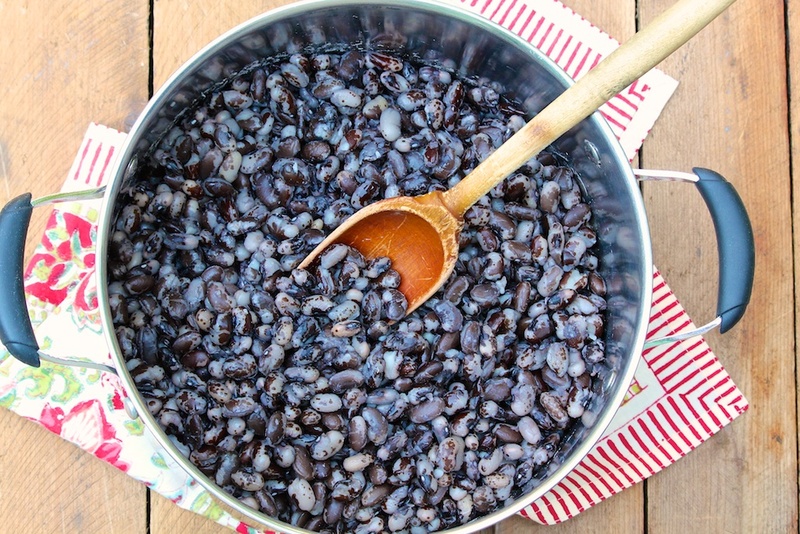 For those who may wonder, orca beans taste a lot like black beans and can be used interchangeably.) Optionally, buying in bulk allows you to choose any amount desired. When planning to use some now and freeze some for later, I typically cook 1 to 1 ½ pounds of beans at a time. To ensure the beans cook evenly, I recommend not cooking more than 2 pounds of beans at a time–and just make sure you have a big pot! They’re great to keep on hand! These are great instructions. I have been looking for some for a while. I like that you included the equivalents, very helpful. Thank you! My pleasure, and thank you for the thoughtful comment, Janice! Do you make sure all of the air is out of the freezer bag before sealing it? I love the convenience of preparing the beans in advance as well as the cost effectiveness. Good question, Sandy, and yes. I do get rid of as much air as possible when I freeze food in general. These beans freeze very well, are economical as you mention, and are so nice to have on hand. You rinse the beans before freezing. Can you freeze them in their own pot liquor? Sometimes that liquid is fantastic. Some people do prefer to freeze the cooked beans in the pot liquid, and you can absolutely do that, Chuck. I think the beans maintain a hint more firmness when drained first, but the difference is not enough to rule out the option you mention…especially if you’d like to use that liquid later.